1. South Park Bridge, Morgantown, W. Va.
South Park Bridge, Morgantown, W. Va.
Bridge to South Park at night. 2. South Park Bridge, Morgantown, W. Va.
A horse drawn carriage and people are walking across the South Park Bridge in Morgantown, West Virginia. 3. 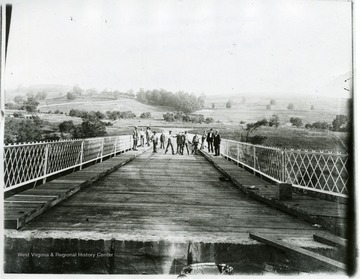 South Park Bridge, Morgantown, W. Va.
Group of men standing near the middle of the bridge. Two are fighting. 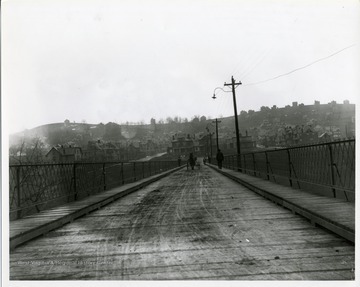 Some men on the walkways of the bridge. 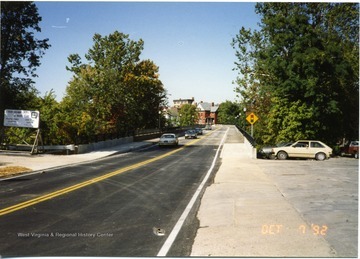 Edge of bridge can be seen. In the distance you can see hills and the pathway. 4. Construction on the South Park Bridge, Morgantown, W. Va.
Construction on the South Park Bridge, Morgantown, W. Va.
Workers can be seen constructing South Park bridge in Morgantown, W. Va. Running pipe throught trenches. 5. Ribbon Cutting Ceremony for the Rebuilt South Park Bridge, Morgantown, W. Va.
Ribbon Cutting Ceremony for the Rebuilt South Park Bridge, Morgantown, W. Va. Parade about to begin on South Park Bridge. 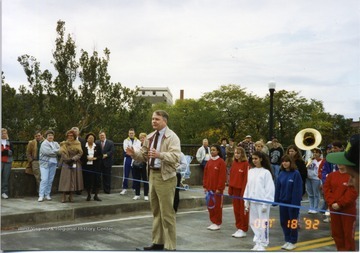 Speaker addressing the public. 6. Construction on the South Park Bridge, Morgantown, W. Va.
Construction in progress of South Park Bridge. Three workers can be seen on bridge. 7. 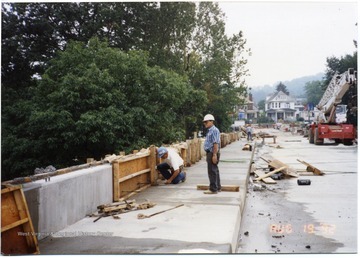 Construction on the South Park Bridge, Morgantown, W. Va.
Nearly completed South Park bridge. Equipment and one worker can be seen. Also, scrap material can be seen. 8. 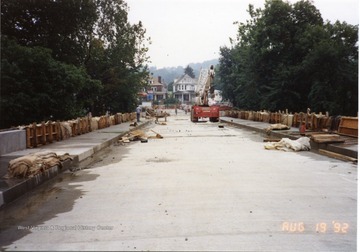 Construction on the South Park Bridge, Morgantown, W. Va. 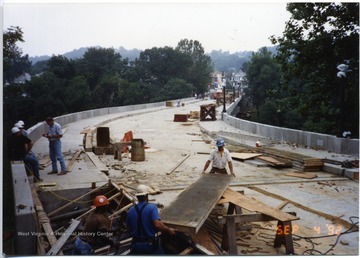 Unfinished bridge can be seen in progress. Workers surround equipment. 9. 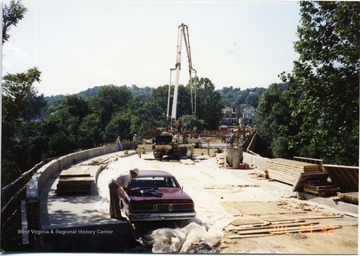 Construction on the South Park Bridge, Morgantown, W. Va.
Beginning phases of bridge construction. 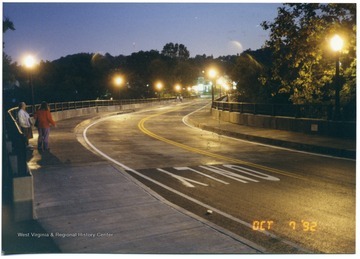 Raw bridge can be seen with little concrete. 10. Construction on the South Park Bridge, Morgantown, W. Va.
A nearly finished South Park bridge. 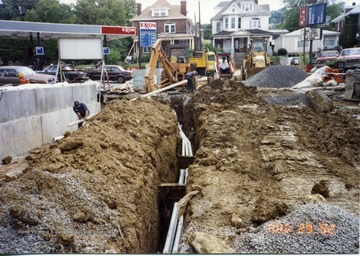 Workers can be seen in progress. 11. 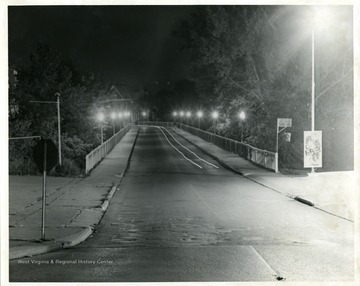 South Park Bridge, Morgantown, W. Va.
A completed South Park bridge can be seen near dark. The lights illuminate the walkways. Two people can be seen viewing bridge. 12. 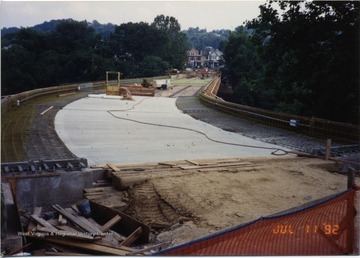 South Park Bridge, Morgantown, W. Va.
Cars can be seen passing over completed South Park bridge.